Murrayfield Racers, with a man-of-the-match performance from 16-year-old defenceman Ethan Reid, will take a two-goal lead into the second leg of their Scottish Cup quarter-final tie with North Ayrshire Wild after a 4-2 win at Murrayfield tonight. In a penalty-filled match, Racers scored all their goals on the power-play. Reid scored twice and bagged a third with a slap-shot from the blue-line with nine minutes to play. 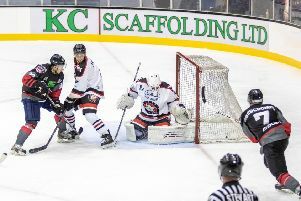 Racers were missing key players including top points scorer Callum Boyd and Latvian defenceman Patriks Grigors following a bruising 6-2 win at Aberdeen Lynx on Saturday, and Reid lapped up the extra responsibility in a fine performance. “I’m just happy to get the ice time and learn from it,” he said: “It was nice to help the boys take away a win in the first leg of the cup. “I like to activate offensively, it’s always enjoyable to help the boys win like that, but my main role is a defensive one. But if opportunities (to break forward) come along I’ll take them. Racers took a two-goal lead into the first period break as Daniel Abercrombie netted with a fine wrap-around, and Reid doubled the advantage in the 20th minute, firing a low wrist-shot from just inside the blue line. An even second period was goalless, but North Ayr roared back in the third. 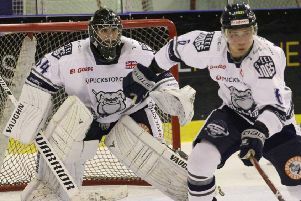 Ryan Parkin got them on the board and, with two players from each side sitting in the penalty box, Wild captain Callum Siebenaler fired an equaliser beyond busy Racers netminder Mark McGill. Unlike their opponents, Racers thereafter reigned in the penalties and after Reid, on a five-on-three opportunity, put Racers back in front, a minute later Michael Ireland made it 4-2, firing home the re-bound after an initial effort from Sean Beattie.